The WISE mission has again come through, this time in the form of a discovery we’ve been more or less anticipating but now see confirmed. 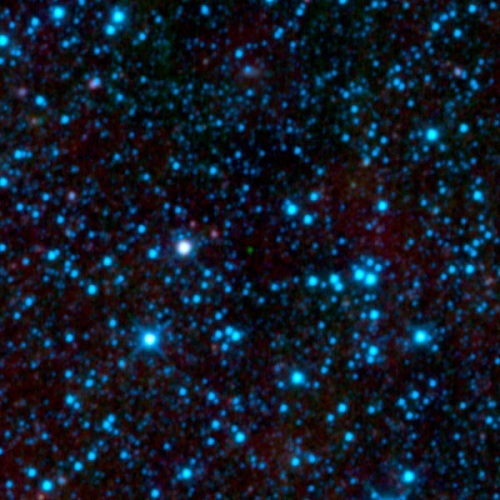 The Wide-field Infrared Survey Explorer works at infrared wavelengths ideal for spotting things we just can’t find with ground-based telescopes. WISE has now turned up six Y dwarfs, stars so cool that you could set your office thermostat to match them without real discomfort. The Y dwarfs range from nine to 40 light years away. Look closely at the center of the image below and you’ll see WISE 1828+2650. Image: NASA’s Wide-field Infrared Survey Explorer, or WISE, has uncovered the coldest brown dwarf known so far (green dot in very center of this infrared image). Called WISE 1828+2650, this chilly star-like body isn’t even as warm as a human body, at less than about 80 degrees Fahrenheit (25 degrees Celsius). Like other brown dwarfs, it began life like a star, collapsing under its own weight into a dense ball of gas. But, unlike a star, it didn’t have enough mass to fuse atoms at its core, and shine steadily with starlight. Instead, it has continued to cool and fade since its birth, and now gives off only a feeble amount of infrared light. WISE’s highly sensitive infrared detectors were able to catch the glow of this object during its all-sky scan, which lasted from Jan. 2010 to Feb. 2011. WISE 1828+2650 is located in the constellation Lyra. The blue dots are a mix of stars and galaxies. Credit: NASA/JPL-Caltech/UCLA. It’s interesting to reflect on how the brown dwarf story has developed. The existence of this category of star was predicted in the early 1960s, but it took projects like the Two Micron All Sky Survey (2MASS), the Sloan Digital Sky Survey and the the Deep Near-Infrared Southern Sky Survey to start turning them up in bulk. But as the paper on the Y dwarf discovery notes, these successes still left a gap of almost 400 K between the coolest brown dwarfs then known (with an effective temperature of 500 K) and Jupiter (approximately 124 K). The existence of a cooler Y class to follow on to the brown dwarf spectral classes L and T seemed more and more likely, and now we have hard evidence for objects too cool to be detected by the earlier surveys. The paper is Cushing et al., “The Discovery of Y Dwarfs Using Data from the Wide-field Infrared Survey Explorer (WISE),” accepted for publication in the Astrophysical Journal (preprint). You’ll also want to see Kirkpatrick et al., “The First Hundred Brown Dwarfs Discovered by the Wide-field Infrared Survey Explorer (WISE),” accepted for publication in the Astrophysical Journal Supplement Series (preprint). What’s the coldest temperature that WISE can detect? Can we anticipate even colder dwarfs? And how much more data is there to analyze from WISE? do these very cool brown dwarfs indeed originate like stars, as a contraction of H2/He gas? Or do they originate as gas giant planets, by means of core accretion around a rocky core? A related question is: do they mainly consist of H2/He gas, or do they also contain large amounts of other gasses and liquids, particularly CH4, NH3, H2O? these Y class objects seem more mild than Yellowstone hot springs..
could they harbor life? With constant convection from the deep core (where temperatures and pressures dissociate chemical compounds), the expected upwellings are certainly out of chemical equilibrium as the plumes cool. Thus it is possible that on one or more of the of the levels of this Dante-esque world, the dust may be populated with living organisms. What a giant flask to cook up new genomes! Given the volume of the object, its long evolution as a brown dwarf, and the variety of micro environments… wow! If life ever were to start (or be introduced) there, it might REALLY have some interesting ecosystems. Ronald, I’d like to see the classification depend on formation rather than mass. Certainly these objects (as well as large planetary mass objects) are observed forming in star-formation sites, so they can and do form “as stars”. Also notice a lot of the discussion in the second paper is about the stellar population mass function. Whether there are BD’s formed “as planets”, which are then ejected, I don’t know, but the implication is they form mostly as stars. The most important bit of the paper to me starts on page 28. Here it is basically saying that what they publish here is the tip of the iceberg. Only 75% of the sky is considered so far, and they have followed up less than 50% of the candidates in that 75%. Added to that, this is the first pass of the data at a high signal to noise ratio. The final pass will be at a lower S/N ratio. Joseph -since the “surface” gravity is directly proportional to mass, all other things being equal, the radii are not much more than Jupiter’s and a BD can be up to 80 times the mass of Jupiter, you are looking at g-forces potentially in the 100g+ range ! I wonder what the surface G-force is like? According to the discovery paper, the values of log g (cgs) for the Y dwarfs range from 3.75 for WISEP J0410+1502 to 5.0 for WISEPC J1405+5534. Converting these to absolute units gives 56 m/s² to 1000 m/s². Daniel, thank you! I had been meaning to dig up the WISE information earlier and got bogged down in other responsibilities. I appreciate your coming up with this. I have to ask: What are the odds that any of these Y type “stars” are actually artificial? Not that I see any professional astronomer wanting to stick their neck out for this idea any time soon. Though when we do find alien life, I have no doubt that many professionals will be shouting that they knew it all along. ljk: what makes you think they’re artificial? Either we have some civilisation that is going to an awful lot of trouble to build things that look exactly like old brown dwarfs which have cooled down to ~300 K temperatures (while leaving no signs of the kind of massive engineering processes they are using to build these things), or these things in fact are old brown dwarfs which have cooled down to ~300 K temperatures. The hypothesis that these things are artificial is at the current time needlessly contrived. But I do like it that whenever any new class of astronomical object is discovered (even ones like these whose existence had been predicted theoretically beforehand) there are always people who go around trying to claim that the objects are artificial. Andy: I think what ljk had in mind was that these could be gigantic artificial habitats that just happen to look like ultra-cool brown dwarfs because ~ 300K happens to be a good temperature for a habitat. This is an interesting, if far out hypothesis. It could be supported by evidence if there was an unexpected peak in the temperature distribution of ultra-cool brown dwarfs around 300K. Eniac, ljk, surely we need a killer argument in favour of artificiality if anyone is to listen. Normally an a priori suggestion of a peak in the data would be sufficient to elicit interest if borne out, yet here I feel an extreme anomaly is required. Proper motion that implies velocity >> 30km/s should do it most easily, and a complete lack of infrared absorption by atmospheric molecules within its spectrum would be helpful. I wonder what the density, size, gravitational strength and surface composition is of WISE 1828+2650 and how it reacts to the impact with another celestial body like a comet or asteroid. Fascinating stuff. I have three related questions plus a fourth question that may sort of qualify as the odd man out. 1). What, if anything, do these preliminary WISE findings tell us about the IMF (initial mass function) into the brown dwarf regime? 2). Are brown dwarfs as common, more common, or less common than red dwarfs in our region of the galaxy? 3). How much wiggle room for the possibility that there is a brown dwarf closer to the Solar system than Proxima Centauri do these latest WISE results allow? 4). To what use might brown dwarfs be put by a hypothetical advanced spacefaring civilization? Eniac, thank you for clarifying what I was trying to say about the possible artificial nature of these objects, which are strange by just about any currently known standard whether natural or not. I presented the artificial idea not because I necessarily think that is what they are (I do go for the “natural” possibilities first when it comes to celestial phenomenon), but because I find that the professional scientists tend to go to extremes to ignore or put down the possibility. I know they are afraid, and often rightly so, of encouraging the fringe elements of those who focus on alien intelligences, to say nothing of harming their careers by supporting way out of box concepts. However, we also risk becoming like those in the days of yore who found the idea of Earth going ’round the Sun or that the Milky Way is the only galaxy in the entire Universe (because the idea of a Cosmos billions of light years across and just as old is just way too big!) too radical and absurd to consider seriously. Even more I fear that we will ignore real evidence for ETI for the same reasons. We have only begun to get a true picture of the Cosmos in the last few centuries and it has been but mere decades that we have had the ability to properly begin real exploration of it with our scientific instruments (and I am not even talking about interstellar probes, of course). So while being scientifically cautious has its benefits, it also tends to kill or frighten off possibilities that may not jive with current common sense but ignore the fact that the Universe does not care about or obey what humans think it should do. And since there has been much talk here about humans one day building worldships that will explore the galaxy, I wondered if someone else has already done a similar project and what those giant vessels might look like from a distance? Would they not try to contain their energy heat and move at a relatively slow pace, for example? And they might also find it prudent not to be advertizing themselves to the rest of the neighborhood. Excessive speculation can lead to some craziness, such as…..
Did you notice that the WISE photo is mostly black? It shows nothing! But what if that nothing is something? It could be that the solar system is surrounded by alien artifacts that are cloaking their heat signature. That could be why we see all that nothingness out there. Be very, very afraid. ljk: please give an example of an example where you feel that the “natural phenomenon” viewpoint is going to extremes to ignore or put down an artificial explanation. I generally get the opposite impression, that those claiming artificiality are deliberately ignoring the more mundane possibilities that make more sense. These brown dwarfs are not strange at all, they are an absolutely expected result for a substellar object that has existed for sufficiently long to cool off to this point from its temperature. They were predicted long before they were observed – it would be far stranger if they didn’t exist. To take a vaguely analogous situation, we can see the hot giant planets orbiting Beta Pictoris and HR 8799 which haven’t yet cooled down to room temperature, and we can see the cold giant planets in our solar system which have cooled even further than room temperature, why should the existence of objects at intermediate temperatures be “strange by just about any currently known standard”? Things that are hotter than their surroundings tend to cool down, that isn’t so mysterious that it requires some explanation requiring the intervention of intelligent beings is it? To actually answer Larry’s question, rather than ignore it, we need to apply the Virial Theorem – that a self-gravitating mass of whatever will have a thermal/kinetic energy less than or equal to half its gravitational potential energy. Assume the ETCs make a big shell habitat, which glows at ~300 K in the IR. How big can it be? We have to make some assumptions about material strength, but unless we’re talking about nuclear-strength matter then there’s a maximum size for a structure supported by its intrinsic material strength. For the strongest chemically bonded materials it’s only a few hundred/thousand kilometres. If it’s supported by gas pressure as well, then there’s only so much gas it can contain before the Virial Theorem says it will collapse in on itself to a smaller radius. For a given temperature and a given mean molecular mass, then we can work out the density and the maximum total gas mass. Interestingly for diatomic gases we know and love the sizes all work out to near Jovian size, but with very low masses compared to natural planets/brown-dwarfs. Thus if we spotted such an object and could measure its mass, then we would have a candidate for artificiality, given those assumptions. Karl Schroeder’s fictional Virga habitat is such an object, though much smaller than the Virial Theory’s limit for a breathable gas mix. Thinking of excessive speculation and taking Ron’s exaltation to be very afraid, I now realise that finding a class of warm objects with anomalously high proper motions is not the ultimate. Horrifying would be finding one such class with typically high parallax, but absolutely no detectable proper motion at all! Ever read the 1984 SF novel Mallworld by Somtow P. Sucharitkul? In the story, aliens have sealed off the Sol system past the orbit of Saturn mainly to keep the rest of the galaxy safe from humanity and for a few other reasons. Oh, I know that these very cold brown dwarfs are probably just very cold brown dwarfs and sometimes a cigar is just a cigar, but as with much of culture these days, people keep falling into one of two extreme camps, rather than properly weighing both sides and coming to a conclusion somewhere in the middle. This certainly includes the idea of alien intelligences and what we think of as unusual celestial phenomenon: Either everything in the Cosmos is of natural origin and we are the only enlightened beings around, or aliens are everywhere and every unidentified light in Earth’s sky is a visiting spaceship. My concern is that professional and amateur scientists alike, in their understandable efforts not to appear as card-carrying members of the Crop Circle Brigade, will miss or ignore something out there that to any other more advanced galactic society says I AM ARTIFICIAL. As I think finding ETI is of major importance to both human knowledge and development, I would hate to have us miss something like this just because the two extreme camps cancel each other out. At least SETI is finally getting out of its 50-year rut of only looking for aliens on Earthlike planets around Sol-type stars, albeit slowly and somewhat grudgingly. As I said, these Y-class “stars” are probably just another type of brown dwarf, but does it really hurt to think outside the limited human cultural box once in a while? Too many in this world already cannot or refuse to focus past the everyday mundanities of life; just imagine what we may be missing out there because we are just barely starting to wake up. I want to thank Adam Crowl for both appreciating the spirit in which I brought up my ideas and for using his extensive knowledge to investigate the possibility of these brown dwarfs being a worldship or something similar. Earth may contain the only flowers in an organic desert of cosmic proportions, or we may be like a colony of ants in the middle of a construction site. If the latter is the case, guess what will likely happen to those ants if they remain unaware of their surroundings. This also applies to the potentially dangerous natural celestial phenomenon. If you look at the second paper linked in the main article, find Table 8 on page 85. There in column 7 you see the space densities of BD’s so far found, broken down into spectral classes. When you take into account it is more likely to be an incomplete census at the cooler end, I think it looks like a pretty flat distribution. The total of column 7 is just 0.0045/cu pc, well below that of stars which is about 0.1/cu pc. However, early days, there are more to discover yet. At the mo it looks like RD’s will win out on number density (see also the chart immediately following Table 8, you can see WISE discoveries vs spectral class -several new RD’s have been found). However -early days. It’s not looking likely is it? Presently they have followed up less than 50% of their candidates covering 75% of the sky. That being the case you could argue there is still 62.5% left over, and that is the first pass at high signal to noise ratio. However, surely a truly nearby BD would have high S/N ratio. If there is one/are some, the chances are it/they can only be small and cool examples. 25% of the sky is not considered yet, so I guess there is chance yet of a larger one. Q4 what use are they? Assume the ETCs make a big shell habitat, which glows at ~300 K in the IR. How big can it be? We have to make some assumptions about material strength, but unless we’re talking about nuclear-strength matter then there’s a maximum size for a structure supported by its intrinsic material strength. For the strongest chemically bonded materials it’s only a few hundred/thousand kilometres. I do not think there is a limit like that on the size of artificial structures. You say yourself that the limit for a gas filled structure is Jovian size. Alternatively, you can use rotating hoops of arbitrary size and spin them such that the compressive effect of gravitation is exactly compensated by the tensional effect of centrifugation. Combine many hoops and you get a cylinder, of arbitrary length and diameter, with nothing but regular materials. Not that I think these obvious BDs are not obviously BDs. However, if you were looking for giant habitats, to the detriment of your career and with little chance of success, BDs would be a good place to start looking. I wish that institutions of supposedly higher learning would encourage more out-of-the-box thinking for their faculty. Instead, these folks often have to do such speculation on their own time and in secret. This is why we end up with the fringe element who make the subject look ridiculous and frighten away the professionals, who might actually come up with a real answer if they could put their extensive training and skills into play. Look at the subject of exoplanets. Before 1995, only a few professional astronomers were allowed to spend their time on the subject, even though it was pretty certain that other stars had planets. Then came along 51 Pegasi and everyone jumped on the bandwagon. They also began to pay attention to earlier discoveries of exoworlds that were dismissed because most astronomers assumed that just about every solar system would look something like ours, because once again we were working with a data point of 1 and it seems to take a massive effort to get the group mindthink to consider other possibilities even when it comes to things we know exist. So note I am not asking universities and research institutions to abandon the scientific method and go off into the literal twilight zone. What I would like to see is more official encouragement of their members being able to mentally play with the so-called out there ideas and see what remains once they have made it through their professional filters. We might actually have found alien life by now if SETI had not been shoved to the outskirts all these decades. Spun structures have much smaller size limits. My size limits are based on gas pressure and the Jeans Mass. Create a shell which holds the gas in via it’s self gravity (gas+shell) and it can be very large. Adam: I explained before that there are NO size limits for properly spun structures. Please point out where my reasoning went wrong. You may have structures in mind that spin to generate artificial gravity of 1g. Those are indeed limited in size, but that is not what I proposed. A hoop spun just enough to counteract its own gravity has no net force acting along its perimeter, regardless of size. A hoop has little in the way of self-gravitational compression, so spinning for artificial gravity will create tension, lots of it if the hoop has a large diameter. It is also prone to resonance instabilities. In the world of fiction, Larry Niven tried to deal with these deficiencies based on the feedback he received on his Ringworld novels. You may be thinking of spheres rather than hoops. However these cannot be uniformly spun and so must be made artificially stable as compression increases from the equator towards the spin axis. This is difficult. Ron S, Eniac, do either of you have references to work done showing the inherent tension/compression resonance instability of Ringworld. From what I can make out from secondary sources, the problem is only made insoluble by the presence of a large central body around which this apparatus attempts to hold “orbit”. I don’t have figures handy. I’ll do a search and see if I can locate those references that I vaguely recall. As Rob correctly notes, the presence of a central mass is very germane. More specifically, is the gravitation due to a central mass or the ring’s (or sphere’s) own mass sufficient to create gravitational compression. If neither of these is the case, it is a tensile structure. Then it’s a matter of whether it’s sufficiently rigid to damp stimuli that could deform the structure or cause resonance effects, or has interior structure (such as spokes) to achieve the same result. If there is a central mass present, such as a star, it is vitally important to keep it centered in the ring, whether or not it rotates, or it will deform and be destroyed. You can spin a ring to exactly counteract the gravitational compression due to a central mass, but if the ring is at 1 AU (for habitability around a sun-like star) the artificial outward gravitational force will be well under 1 g. Therefore the ring must rotate faster, and will require high tensile strength. As I said, I don’t have the references handy (it’s been many years) so I am relying on my memory. These last calculations should be easy enough to perform, so maybe I’ll tackle it if I have a chance. A sphere around a central mass has a variety of structural challenges. If it’s spun, these challenges only increase because of compression/tensile gradient across the surface. For habitable purposes, if not spun you’d need to be on the outside surface, and if spun the sphere could not be fully utilized. The latter would seem to be preferable. The Virga habitats use the whole of the interior volume, but require internal mini-stars to provide light/energy for the inhabitants. If gravity is required for healthy living – something Schroeder assumes – then internal structures can be spun for centrifugal gravity. His society within the Virga is kept artificially at a steam-punk level of technology by the makers, but that’s irrelevant to searching for real world examples. My search of peer-reviewed material turned up lots of blanks except for ancient references to material that is 3 to 4 decades old and may not exist in electronic form. It does appear true (and it seems so to me) that such nuclear material is not at all stable and therefore there is no known material that provides the needed strength. I didn’t do any of my own calculations about spin velocity, although I did run across one that Niven did (or was done for him) for his ringworld. A 1 AU radius ring around a solar-mass star requires a tangential speed of 1,240 km/s to generate 1g artificial gravity on the interior surface. This is more than 40 times Earth’s orbital velocity (30 km/s); or, in other words, 40 times the velocity needed to counter stellar gravitation at 1 AU — the velocity at which gravitational compression (due to the star) is exactly negated. The tensile strength calculation in the second URL above seems to have been done for the Niven ringworld. The tension in the ring directly depends on the mass of the ring material and habitat, if any. Sorry, but that’s all I’ve got. I didn’t even attempt to confirm any of the referenced calculations. PASADENA — NASA unveiled a new atlas and catalog of the entire infrared sky today showing more than a half billion stars, galaxies and other objects captured by the Wide-field Infrared Survey Explorer (WISE) mission. “Today, WISE delivers the fruit of 14 years of effort to the astronomical community,” said Edward Wright, WISE principal investigator at UCLA, who first began working on the mission with other team members in 1998. WISE launched Dec. 14, 2009, and mapped the entire sky in 2010 with vastly better sensitivity than its predecessors. It collected more than 2.7 million images taken at four infrared wavelengths of light, capturing everything from nearby asteroids to distant galaxies. Since then, the team has been processing more than 15 trillion bytes of returned data. A preliminary release of WISE data, covering the first half of the sky surveyed, was made last April. The WISE catalog of the entire sky meets the mission’s fundamental objective. The individual WISE exposures have been combined into an atlas of more than 18,000 images covering the sky and a catalog listing the infrared properties of more than 560 million individual objects found in the images. Most of the objects are stars and galaxies, with roughly equal numbers of each. Many of them have never been seen before. WISE observations have led to numerous discoveries, including the elusive, coolest class of stars. Astronomers hunted for these failed stars, called “Y-dwarfs,” for more than a decade. Because they have been cooling since their formation, they don’t shine in visible light and could not be spotted until WISE mapped the sky with its infrared vision. WISE also took a poll of near-Earth asteroids, finding there are significantly fewer mid-size objects than previously thought. It also determined NASA has found more than 90 percent of the largest near-Earth asteroids. Other discoveries were unexpected. WISE found the first known “Trojan” asteroid to share the same orbital path around the sun as Earth. One of the images released today shows a surprising view of an “echo” of infrared light surrounding an exploded star. The echo was etched in the clouds of gas and dust when the flash of light from the supernova explosion heated surrounding clouds. At least 100 papers on the results from the WISE survey already have been published. More discoveries are expected now that astronomers have access to the whole sky as seen by the spacecraft. NASA’s Jet Propulsion Laboratory (JPL) in Pasadena, Calif., manages and operates WISE for NASA’s Science Mission Directorate in Washington. The mission was competitively selected under NASA’s Explorers Program, which is managed by NASA’s Goddard Space Flight Center in Greenbelt, Md. The science instrument was built by the Space Dynamics Laboratory in Logan, Utah, and the spacecraft was built by Ball Aerospace and Technologies Corp., in Boulder, Colo. Science operations, data processing and archiving take place at the Infrared Processing and Analysis Center at the California Institute of Technology in Pasadena. Caltech manages JPL for NASA.